You don't need a professional painter to transform a plain room with a designer look. Some complex decorative finishes may require the help of a pro, but there are many tools available to ensure you have excellent results to do it yourself. Preparation will ensure the painting process is easy. Many of the paints on the market include a primer known as a 2-in-1 paint (paint and primer). There are many arguments for why you should use a primer before painting. It always pays to discuss with the paint dealer before committing to skipping a primer. Flat (matte sheen): This low-luster paint has a slightly reflective finish and hides most surface perfections. It's a good choice for walls and ceilings and easy to clean with a damp sponge. Satin: This enamel paint has a pearl-like finish that's easy to clean. Eggshell: This finish has a velvety look and resists dirty grim and mildew. Semi-Gloss: This finish is radiant reflective and resists moisture and mildew. Often used for doors, trim and cabinets. Hi-Gloss: This is a very shiny reflective finish and makes cleaning easy. Good choice for trim, doors and cabinets. You'll need to decide on either latex (water-based) or oil-based paint. Latex paint provides longer wear and simple soap and water clean-up of brushes and rollers. Oil or alkyd paint repels staines and highly durable, but does require mineral spirits, turpentine, or paint thinner to clean up painting tools. Latex paint cannot be used over oil-based paint, but oil-based can be painted over latex. If you don't know the type of existing paint, clean a small area with detergent water, rinse and towel dry. Rub a spot with alcohol-dipped cotton ball. If the paint comes off, it's latex. Once you've decided on the type of paint needed, it's time to decide on a color scheme for your room. 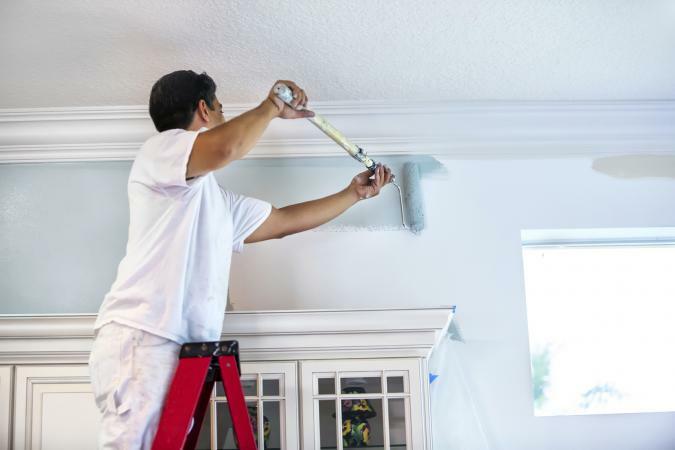 You will paint more than just walls; you may need to paint the ceiling and wood trim as well. Testing paint colors before buying paint can prevent color choice mistakes. A color chart can be helpful for deciding various color combinations, such as an accent wall, trim color and ceiling color. Some companies offer color collections for specific design styles, such as historical homes color palettes. Take color samples home to view in the lighting of your home. Decide on a few colors and purchase paint samples to test on one wall. Calculate how much paint you'll need. One gallon will cover about 400 square feet. Calculate the trim square footage for the trim paint needed by multiplying the length by .5. Lowe's offers an online paint calculator to help you figure it all out. Most paint store websites offer a virtual way for you to see how a color will look in a room, so you can select various colors to apply to their generic room. Some even allow visitors to upload actual photos of their rooms and apply the virtual paint samples. Like the science of Quality Control processes, if you get the first 20% set-up and preparation right, the remaining 75% will fall in place for a successful outcome. This is very true of painting projects. Preparation is the key to a successful painting project. Remove all window treatments, pictures, mirrors, rugs, hardware and switch plates. Move all furniture out of the room or to the center of the room and use drop cloths to cover remaining furniture. Use drop cloths to cover exposed floor. Make sure the walls and woodwork are clean. Spackle nail holes and cracks, allow to dry, sand until smooth, and wipe away residue. Apply painter's tape around top of crown molding or top of wall that joins ceiling. Cover light fixtures with plastic and tape over any remaining hardware. Open a window or door and use a fan for appropriate ventilation. If you're painting over wallpaper, make sure you follow proper steps for prepping (and subsequently painting) the room, like applying caulk around the wallpaper seams and evening out texture with spackle. You need to apply painter's tape along the crown molding or top of wall where it joins the ceiling before you can begin painting ceiling. Open paint can with the opener from paint store or a flat head screw driver. Press a flat head screw driver into the indented portion of the paint can rim and strike the top of the screw driver with a hammer 2-3 times until the end of the screw driver pierces the paint rim. Carefully pull the screw driver out and repeat 3-4 times. These holes will allow residue paint that would ordinarily collect in the rim to drip back into the paint can. When you cut in a space to be painted, you want to use a paint brush. You can work with a partner; one to cut in paint and one to paint with a roller. Dip brush one-third into paint. Without scraping the brush, remove from paint and turn brush so bristles are up. Hold brush as though it were a pencil. Apply paint to the ceiling corner, using even stroke and feathering paint from edges along tape lines and out from edge. Continue to paint along the line where the wall and ceiling meet. Once you've cut in the paint, it's time to break out the roller. Don't worry if paint gets on woodwork/trim or wall since you'll be painting over it. Use a rag to wipe off any stray paint so it doesn't create a drip. Professional painters use a roller grid with a bucket, but you can also use a paint tray. Use the extension roller for easy of use. Dampen the roller using a wet rag. This will assist the paint in loading onto the roller. Move roller over the grid in bucket or tray to load roller. Apply with even pressure to the ceiling in a zig-zag pattern a few inches from the edge. Be sure you overlap paint lines and work in 4-foot sections. Work slowly, otherwise the paint will splatter, mostly over you and everything below the ceiling. Once the ceiling is finished, begin painting the walls. Cut in the walls (work in pairs to make work go faster). Using a roller start in a corner. Apply paint in a zig-zag pattern overlapping paint lines. Work in 4-foot sections with light pressure and work one wall at a time. Lightly roll from ceiling to the floor to smooth out paint. Turn roller sideways to paint edges of ceiling and baseboard. Second coat should be applied working from ceiling to floor with even strokes. 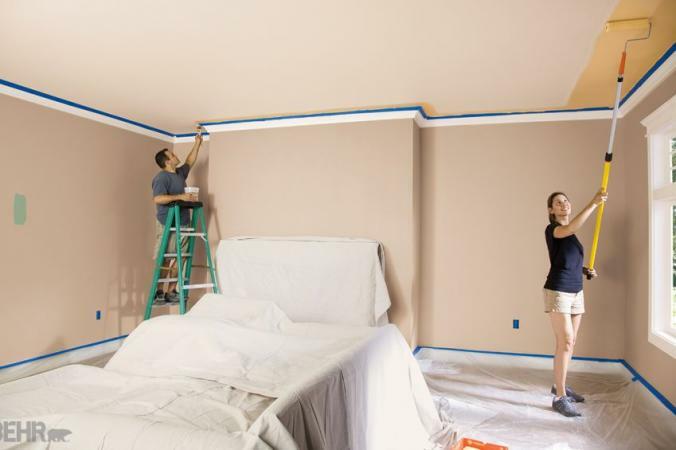 Remove painter's tape before paint dries to prevent peeling. Once you've mastered painting a basic wall, considering trying some interior painting techniques that require a little more skill, like faux marbling, rag rolling, or sponge painting. Allow ceiling and walls to dry before painting the trim. 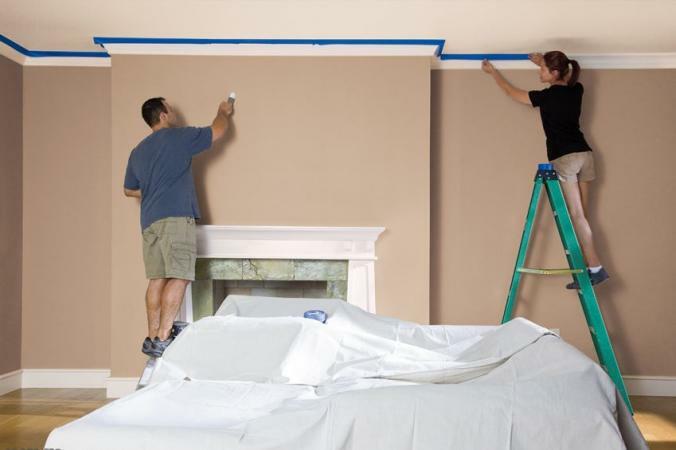 Apply painter's tape to protect walls and ceilings. Use a paint brush to apply paint to trim. Slowly remove tape before paint dries. If you aren't able to complete your painting project in a day and it will need to be accomplished over several days, you can avoid unnecessary clean-up of rollers and paint brushes. Wrap paint rollers still attached to the roller and paint brushes with plastic wrap followed by aluminum foil and place in a freezer. Remove an hour before painting, unwrap and continue painting. Latex painting tools can be cleaned with water and soap. Allow brushes to air dry before storing. Oil-based paints can be soaked in turpentine or paint thinner and later washed with soap and water. All to air dry before storing. Follow the manufacturer's recommendations for storing unused paint, mineral spirits, paint thinners and turpentine. If you are going to dispose of any of these chemical, you must comply with household chemical waste for any trash collection. Fold up drop cloths and store for future painting projects. If you prepare and follow each step, you'll end up with a positive painting experience and wonderful new room. You and your family will enjoy the freshly painted room for a long time if the job is done correctly.